Search 8 E Randolph Chicago Loop condos for sale & real estate in Chicago. 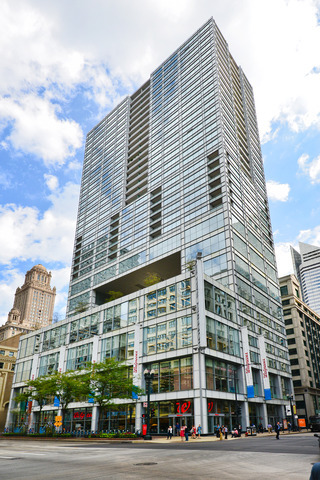 Joffrey Tower is a condo building in Chicago, Illinois that offers a wide range of amenities to fit any lifestyle. Find the newest 8 E Randolph condos for sale & real estate property listings in 8 E Randolph below! Browse our Chicago condos, lofts, Chicago penthouses and Chicago highrise condos for sale by location, size or price and let this website be your local real estate guide. We would love to be your Chicago real estate agents and assist in the condo buying process. For information about 8 E Randolph properties for sale or to schedule a private condo showing, contact your Chicago Loop real estate experts today. Read more about 8 E Randolph real estate. Selling or buying a condo at 8 E Randolph soon? Call Guarnero Group Compass at 312-810-6693. Our community of 8 E Randolph real estate agents will help you navigate the Chicago Loop condominium market. Constructed in 2008, The Residences at Joffrey Tower (formerly MOMO), is an exciting development to hit Chicago's downtown Loop neighborhood. This gleaming architectural masterpiece located at 8 E Randolph represents cutting-edge design and contemporary flare. Its predominantly glass facade and clean lines are the definition of urban chic. At Joffrey Tower, high-quality craftsmanship blends seamlessly with sophisticated style, bringing to the Loop one of the most desirable new mixed-use residential condominium and commercial real estate developments in all of Chicago. This address, once the site of the Masonic Temple, is dubbed Joffrey Tower because the Joffrey Ballet has purchased 45,000 square feet on the third and fourth floor of the structure for its new home. Across State Street from Macy's, the flagship location of the Chicago landmark Marshall Field and Co. building, the Joffrey Tower holds a prestigious address. 8 E Randolph is an exciting new development that offers all the modern luxuries discerning homebuyers have come to expect. Standard finishes are quite spectacular and include kitchens that are decked out with European cabinetry, granite counter tops and stainless steel appliances. Master baths are finished with Grohe faucets and marble floors. Floor-to-ceiling windows provide the perfect vantage point from which to soak in the stunning surrounding skyline and unobstructed views of Millennium Park and Lake Michigan. Spacious balconies and hardwood floors are some of the other desirable attributes of Joffrey Tower. Building features include an enormous fitness center, a gracious party room and a soaring lobby with a 24-hour doorman. Joffrey Tower's location is unbeatable. Not only are Chicago's natural treasures, including Lake Michigan and Grant and Millennium parks just minutes away, but Joffrey Tower is also surrounded by the city's theater row. So, cultural entertainment is easily enjoyed. Joffrey Tower is also well-positioned so that residents can easily take advantage of the fabulous shopping that lines both State Street and Michigan Avenue. Just steps from numerous public transportation options, accessing anywhere in the city couldn't be simpler. Lastly, but certainly not least, Joffrey Tower is a true walk to work building so hassle-free commutes are guaranteed. Thinking of buying or selling a condo in 8 E Randolph? Let our local Chicago Loop real estate agents help guide you through the purchase of your next property or expertly negotiate the sale of your current 8 E Randolph condo. As local Joffrey Tower real estate agents and real estate agents, we're experts on the market dynamics unique to the Chicago IL real estate market. We'll get to work for you today! Contact Guarnero Group Compass to learn more about buyer or seller representation. Planning to sell your Joffrey Tower condo? Contact us to learn more about a possible property evaluation for your 8 E Randolph condo in Chicago!